Boogie Knights is a silly, spooky story about the annual Madcap Monster Ball. It’s midnight in the castle, and the prince can’t sleep. 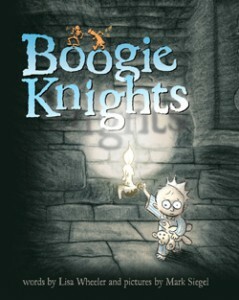 His seven ghostly knights in armor (plus a spirited princess) make their way down to the dungeon to dance the night away. While the prince creeps around trying to see what’s happening, werewolves, vampires, and all kinds of ghouls have a great time. This is a neat ghost story and an obvious choice for a silly read aloud near Halloween.